expensive live plants. I tried to replicate indoors what my sister, living in Southern California designed in her back yard aviaries. On my first visit to California, I couldn't wait for sunrise each morning to pour my cup of coffee, wrap a blanket around my legs and rush outside to sit and watch her birds dive and soar in the sunlight and dart from shrub to shrub in excited exploration! It was truly the most soul soothing experience I have ever had. When I returned home, my dream was to combine both my hobby of raising birds and my love for gardening in my bird room just like my sister. Within the first three weeks I realized my dream had become my nightmare. My finches chewed up and pooped and pooped and pooped on every plant I had in the flight! It was a complete mess! I tried everything to keep the beautifully planted flight clean but in the end I pulled all the plants out. The one thing I didn't take into consideration was that my sister could use her hose. Every couple of days, like magic, she just sprayed all the poops away with her lawn hose! If you decide you want a beautiful planted flight in your home where you can sit an enjoy your birds, make sure you pour a cement floor with a drain first! Although bird owners worry about plant toxicity, veterinarians rarely diagnose plant toxicity in pet birds. I have included a list of safe and possibly harmful plant species, thanks to the efforts of Myra, my webmaster, who spent hours of research to come up with this great list of safe and dangerous plants. An aviary decorated with live, exotic plants is always the dream when one starts planning for a large-scale aviary. Naturally however the dream can become longer than our homes budgets allow. The complete garden paradise for your birds may have to remain a dream, but that doesn't mean you can't add a little nature to your aviary. Even small, single pair flight cages can be accentuated with a little greenery either beside the cage or draped on top. Plants do more than just add a little color to your finch set-up. 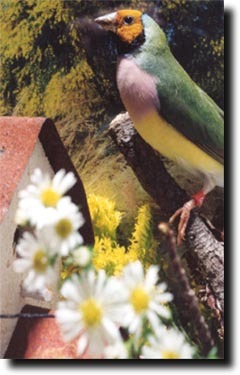 They also provide the finches with a feeling of extra security, especially if they can hide behind or inside the plant. When live plants are used, the plants often become another food source and/or natural nesting material. They also give the finches something on which to perch other than their wooden perches. Because your finches will chew up, poop, and destroy any plant you provide always choose a plant that is safe for them (non-toxic). In return it's best to buy a plant which can also survive the finches attack. For more delicate species, it is best to allow the plant leaves to hang into the aviary or cage while keeping the majority of the plant outside the finch's reach. Potting soil can be just as dangerous for finches as some plants can be. Most plants sold in stores come with nutrient enriched dirt that is also treated to prevent weed growth. Many of the fertilizers and chemicals used are quite toxic if ingested. Finches are known for trying to eat everything in sight. If a live plant proves too much of a risk for you, maybe a fake plant would work better. There are two basic types of fake plants: Plastic and Silk. Plastic plants are a bit hardier and handle the chewing quite well. Plus they clean very easily and are fairly inexpensive. Silk plants can literally be unwoven by some of the more determined finches and end up as nesting material. They are a little more expensive than plastic but also cleans up just as well. If you do chose a flake plant you must note that many potted fake plants use a painted foam base to simulate dirt. This foam is dangerous for finches and shouldn't be put within beak range. Personally I've always preferred the vine type plastic plants. They don't have a pot and therefore no foam. They are simply a long string of vine, leaves and colorful flowers. Below is a large list of safe and dangerous plants. Always use your best judgement when selecting any addition to your aviary.